This short story duo (with a micro story thrown in at the end as a bonus) was a treat to read. The first, "Two Things", has rather the feel of a "Shawn of the Dead" mixed into "Red Dwarf". I realize that's comparing a short story with a movie and a comic sit-com, but I can't think of anything else to relate it to. It's a little campy and manages to weave some suspense into the storyline. The second, "Escape from Ape City", evokes a light-touch romanticism, a bit of everyman as hero, and an admirable "let's all take care of each other" spirit that I'm a total sucker for. It sketches out a brief narrative involving ...(ok, don't laugh)... gangs of zombied apes the size of King Kong. (Ok, fine: laugh. Or at least smile.) But it works. At least it did for me. There's no real horror or gore, and it was over before my tendency to sympathize with every being (including zombie apes) could erupt to prevent me from enjoying it. The entire set was only 24 pages in my ereader and gave me a nice reading intermission when I had brief snatches of time to while away.It's currently available for free download at Smashwords. Amanda C. Davis shows her skill as a storyteller yet again with these two short zombie tales. Like all my favourite kinds of zombie stories these aren't weighed down by gratuitous gore and over-the-top violence. I consumed these short stories in no time at all and then went back to the start and read them again just to see if I'd missed anything (I had) and enjoyed the re-read as much as the first. 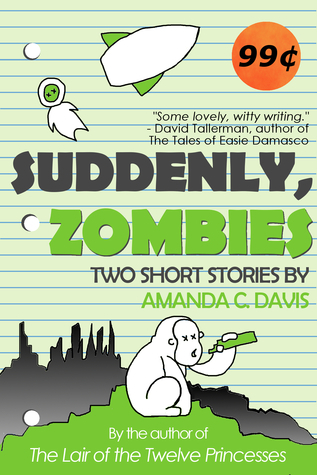 I enjoyed the two short stories in Amanda Davis' Suddenly Zombies (spoiler alert: the stories are about zombies! ), but my favorite was the amuse bouche "Memories". One page, two paragraphs that will make you laugh. Don't miss it!